Arrival is one of those movies where you understand you're waiting for the resolve to see if it justifies the journey we've taken to (pun intended) arrive there. This doesn't mean the one hundred minutes prior aren't fascinating and worthwhile, but it's clear we're ultimately waiting to see what bigger picture these pieces are painting. This can of course be something of a double-edged sword given how the approach effects the re-watchability of a picture, but by the time we come around to the conclusion of Arrival it only seems repeat viewings will do nothing but make it more moving if not add shades and complexities to small nuances we may not have noticed upon that initial viewing. In other words, Arrival is a masterfully told narrative that deals in themes of interpretation and perspective through conveyors such as language and the guise of an alien invasion movie. What's interesting though is, despite the marketing, Arrival is hardly about an alien invasion, but more a film about communication and figuring out one another before jumping to conclusions based on cultural precedent or expectation. Arrival is about that fear of what we don't know and how such a phrase manifests when a genuine situation arises that it can be applied to. In the barrage of CGI summer blockbusters that depict alien invasions more as mass extinctions it's become easy to feel nonchalant about the ramifications of proof of life beyond our earth and solar system legitimately existing and furthermore, showing up in our backyard. In Arrival, director Denis Villeneuve conjures not only a palpable fear and panic that would sweep across nations in light of such events, but more he and specifically Amy Adams in an absolutely stellar performance highlight the sheer incomprehensibility of the situation. 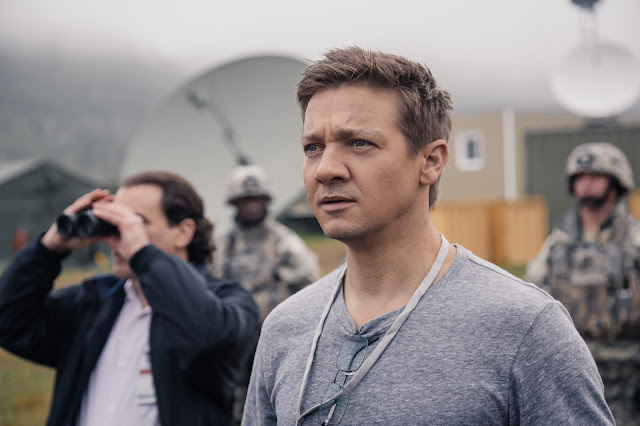 Giving insight to the smaller moments, recognizing the first time Jeremy Renner's Ian Donnelly touches the material this alien craft is constructed from as a major moment rather than choosing to ignore its significance speaks volumes. In this way, moments that are actually bigger play as that much more profound. Villeneuve is a master of restraint and the slow burn as he has shown in previous features such as Enemy and Sicario, but Arrival may be his most accomplished work to date as not only is it visually enrapturing, but the larger ideas the film has on its mind are applied to its precise visual sense giving the experience an all-around aura of awe. Dr. Louise Banks (Amy Adams) is called up to the big leagues in Arrival. 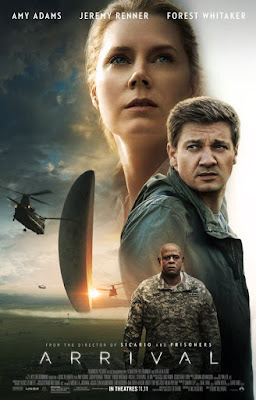 Based on a short story by Ted Chiang called "Story of Your Life," Eric Heisserer (Lights Out, Final Destination 5) wrote the screenplay that follows Adams' linguist, Dr. Louise Banks, as she is recruited by the U.S. military with Forest Whitaker serving as the face of the armed forces. Banks is recruited due to the fact twelve identical crafts have appeared at different points across the planet and, as a linguist at the top of her field, she is the obvious choice to help set up some kind of communication with the extra-terrestrials. There is never any dispute these are alien crafts and Villeneuve's film only falls into one category of "alien invasion" movie cliché when his main character, like many of us would, stays glued to news programming that reports on the developing status of these unknown objects and their purpose. It is when Banks is approached in her office at the small college where she teaches and then later picked up in the middle of the night from her secluded, but comfortable home by Colonel Weber (Whitaker) that we begin to feel closer to these events. Closer not just in terms of physically, obviously Banks is brought to the home base that has been set-up just outside the ship that is hovering over part of Montana, but closer in the way that Banks is integral to these events now-that her presence there truly factors into how this scenario will play out as opposed to how it could play out. This feels a large part of the films intent due to the performance of Adams who exudes a sense of optimism and ease within an atmosphere of menace. Whether this certain tone of mood is due to a mix of expectation and intent is almost unclear despite the fact Villeneuve and especially composer Jóhann Jóhannsson are very much wanting to move viewers in the direction of ominous. Meeting Renner's Donnelly, a theoretical physicist, on the helicopter ride to the craft there is an amalgam of competition and respect between the two, but it is when the duo really begins to put their heads together that the film consistently delivers on the promise of its early intrigue. Make no mistakes, Arrival is a film that paces itself in a deliberately slow fashion, but it never feels tedious. Rather, the development of communications between our protagonists and the visiting species develops naturally with much of it only serving as a methodical sequence of events to be sprinkled with moments of legitimate weight that compliment and reinforce the building themes. Arrival is also one of those movies one has to discuss without really discussing. In light of such being the case, it seems best to say that as much as Arrival puts on to be about the appearance of aliens from outer space it is actually about the one thing we, as a human race, can't get more of: time. What does this universal truth have to do with aliens? While on the surface it is something of a solution to the central questions of, "Why are they here and what do they want?" it is additionally the theme to which we take away more than a batch of unanswered questions despite knowing the facts of our reality. We are unable to create more time to exist within, we are unable to prolong moments we would ideally live in forever, and we have to come to accept that unlike the movies, life offers no clear beginnings or endings, but rather individual days that will end up defining the rest of our lives. In the case of both Dr. Banks and Donnelly, the day these aliens arrive would become one such day though not for the reasons we might expect. Arrival ultimately deals with time in a layered and complex way that cannot and should not be described here for the sake of preserving the films mysteries and third act revelations, but beyond this to the fact it deals with time in such a fashion that it cannot be summed up by a few sentences within a synopsis. No, Arrival isn't actually about what the aliens are after on earth or what they look like, but instead what they can do for us and how shining a new light on subjects we already thought absolute can change our outlook on the life we're leading and our perception of the time that life is meant to fill. Despite discussing such heady themes-what is it exactly the movie has to say about these ideas-if anything at all? It's a fair question-plenty of intellectuals and intellectual pieces of art can fall guilty to discussing certain beliefs and concepts without actually adding anything new to the conversation, but I'd find it hard to argue Arrival doesn't at least attempt to add something to this theory that the language one speaks can determine how you think or, in other words, the real-life idea that language can affect a person’s perception and cognitive worldview. Arrival takes this one step further by saying that not only can language effect perception, but give you a certain amount of control over it. Dr. Ian Donnelly (Jeremy Renner) finds himself more impressed with his new colleague than earth's new visitors. What makes Arrival even more beautiful is the fact it doesn't pretend to have answers to its own resolutions. Sure, there are spectacular feats accomplished and more or less explained, but when it comes down to the "how" of certain things happening it leaves such conundrums up to the audience to speculate on. Taking into consideration such possibilities as this race of alien "heptapods", as they are referred to by Donnelly and other scientists in the film, not having the same way of explaining or viewing something like time the way we do on earth and how (spoiler), by teaching our protagonist as much through her ability to break down the language barriers, they might open up a door to new potential and possibilities for our race is profound in a way that cannot necessarily be explained-kind of like God or time itself. Of course, the revelation of what is actually being learned and is occurring throughout the film might then serve as too much of a head trip for some while not being as unforeseeably astonishing as others might hope, but it hit this viewer in the gut just as I imagine Villeneuve, Heisserer, and Chiang would hope it might. In short, my entire body got chills at a certain moment of realization. 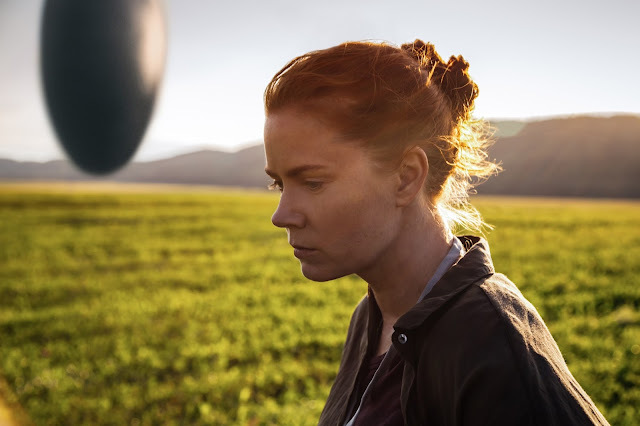 It is difficult to even discuss outside factors when the story is as wholly consuming and involving as what Arrival offers, but the experience as a whole is certainly a fusion of multiple components that stand to push its narrative to the forefront. Being able to find Adams' Banks as endearingly simple as can be outside of her obvious superiority in her field of study is key to the audience keeping up with our main characters plight and remaining invested despite certain sections potentially being considered dull or purposefully slow. Adams is truly spectacular though, capturing the full effect of what she is experiencing largely through her eyes. There is more to her performance, of course, but the wonder she is able to convey simply through these organs that show us the world is undeniable and it effortlessly extends to the audience. Renner, though not having nearly as much to do, is more than suitable in the supporting role that requires a composed and compassionate presence to be developed and trusted over what is a relatively short period of time. Michael Stuhlbarg and Tzi Ma are also notable in their supporting roles and any discussion around Arrival shouldn't be complete without at least mentioning cinematographer Bradford Young (A Most Violent Year, Selma) as it offers some truly breathtaking photography. And still, this idea of time and how it can either confine or set us free permeates throughout every frame of Villeneuve's film as this idea of placing emphasis on details over occasions is exemplified in showing a soldier who is on the front lines of this alien encounter dealing with the dynamic of his wife not liking the fact he is there. It is these smaller moments that are the ones that shouldn't necessarily stand out, but for some reason stay with us in a very personal way. They'll always be there, they are inescapable, burned into our brain for one biological reason or another and Arrival encourages us to embrace them for better or worse because no matter how they're perceived they're all we have.